At the end of a long and tiring day, spending a lot of time cooking dinner is not always appealing. But with a hungry family ready for dinner, you need a meal that’s quick and easy, has minimal cleanup and is healthy and satisfying. The solution? A soup pot and some on-hand ingredients are all you need to get a wholesome dinner on the table fast. Soup is inexpensive, too; most soup recipes can be made for less than $3 a serving. Find out EatingWell’s 6 secrets to speedy soup success. Keeping your pantry stocked with soup-ready ingredients is the best way to ensure a flavorful healthy soup can make it onto the table. This list of kitchen staples is a starting point for some basic soup ingredients that, when kept on hand, will help you pull dinner together in a flash. Some store-bought broth delivers close to 1,000 mg of sodium per cup—the majority of your daily recommended sodium intake! When shopping, Eating Well’s Test Kitchen Manager Stacy Fraser advises you look for reduced-sodium (averaging 500 mg/cup), no-salt added (averaging 200 mg/cup) or low-sodium (140 mg/cup or less) stock or broth. Some canned broths are lower in sodium than others, so check the nutritional panel to compare among brands. And keep in mind—the flavor of the broth will affect the final dish. Taste it first, and if it doesn’t taste good to you, try another brand until you find one that pleases your taste buds. Or make your own and freeze it for when you’re ready to cook. Whole grains and whole-grain pastas add nutritional balance and heartiness to soups. Quinoa takes 15 to 20 minutes to cook and delivers 3 grams of fiber per 1/2-cup serving. Quick-cooking barley, which cooks in 10 to 12 minutes, is technically not a whole grain, but it counts toward your whole-grain servings because of its high fiber content. Fresh or frozen whole-wheat ravioli cooks in minutes and turns a light vegetable soup into a satisfying main course. Look for whole-wheat ravioli in the refrigerated or frozen section of the supermarket. Whole-grain elbow macaroni and penne are also quick-cooking and provide a boost of fiber. Use pre-cut vegetables as a shortcut that saves time while still creating a nutritious dish. Frozen vegetables save time, money and are always at the ready in the freezer. Plus, when fresh vegetables are out of season, choosing frozen vegetables may deliver more nutrients, since they are usually picked and frozen at the height of ripeness. Canned tomatoes and chiles also add nice flavor without much effort. And don’t be afraid to pick up some pre-cut fresh veggies in the produce section or from the salad bar, such as diced carrots, sliced peppers and precut broccoli and cauliflower florets—they eliminate time-consuming prep. Add depth of flavor to quick-cooking soups by using ingredients like herbs, spices, strong cheeses and flavorful meats. 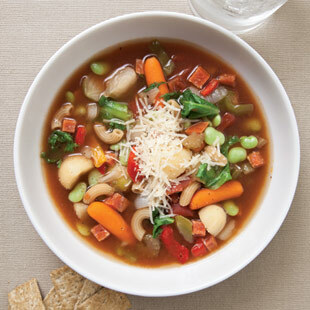 A half cup of diced pepperoni adds spicy, complex flavor to minestrone. Adding 2 teaspoons of dried tarragon to salmon chowder gives the soup a unique character. Grated Parmesan, ground allspice, caraway seeds and even peanut butter are all great ingredients to add a slow-cooked feel to a quick-cooking soup. Find out what 1 spice to add to your soup to boost your metabolism here.